Welcome to More Than Hearing! More Than Hearing is a podcast designed to encourage preachers to use Multiple Intelligence Theory in their sermons and worship leadership. We established this podcast based on the work of Dr. Howard Gardner, a professor of education at Harvard University. Dr. Gardner developed a theory based on research and observation that humans have several “minds” or kinds of intelligence by which we experience, process, remember, and interact with the world. Dr. Gardner eventually identified eight different intelligences: Verbal-Linguistic, Visual-Spatial, Mathematical-Logical, Bodily-Kinesthetic, Musical-Rhythmic, Naturalistic, Interpersonal, Intrapersonal. While all people seem to possess capacity for all eight, each person has particular intelligences that are stronger, better developed, or come more naturally. We believe that these intelligences can play an important role in renewing the worship life of congregations. In our podcast we offer sermon illustrations and special effects for the weekly readings of the Revised Common Lectionary, based on Dr. Gardner’s intelligences. In the show we refer to them as: Word smart, Eye smart, Math smart, Body smart, Music smart, Nature smart, People smart, and Self smart. Any time and any way we can use these “smarts” in worship, we give people more opportunities to engage, understand, and internalize the Word of God in ways that make sense to them. It’s a different way of thinking about your preaching. It doesn’t change the need for good exegesis, and it doesn’t change the basic intent or message of your preaching. You don’t preach the eight smarts! Rather, using the smarts makes you think about your hermeneutics differently. For the vast majority of the Christian era, our primary means of transmitting the Gospel as preachers and teachers has been through the spoken and written word. If Dr. Gardner is right, then we have a huge hole in our preaching tool box! So we got the idea to try examining the texts from the perspective of all eight smarts. Then we try to find ways within each of the smarts to convey the message of the text. We do this through both illustrations and special effects. He walked into the dark sanctuary. The streetlight outside shone through the stained glass, casting red and blue puddles of light across the floor, all the way up to the chancel. The windows, as they were designed to do, pointed toward the vaulted ceiling, and he couldn’t help but turn his gaze momentarily upward into the cavernous dark. There! Did that create an image of space and light in your mind? That’s using words to create an Eye smart reaction. You can do the same thing for all the smarts! Use your words to describe problem solving (Math), outdoor scenes (Nature), or the drama of relationships (People). That’s how illustrations work! Another option is to use the shorthand of common experience or cultural references, where you just have to call to mind something people are already familiar with. “Special effects” or “SFX” are a more direct experience to connect with a particular intelligence. These are activities that you the preacher will do or direct the people to do. If you have ever done children’s sermons with object lessons, you already have an idea how this works. SFX are intentionally less Word smart, although they often touch on multiple smarts for the congregation. We recognize that even though we are designing the illustrations and SFX with a particular Smart in mind (as it were), people will still process them from their particular strength. Word smart folk will be listening to what we say as we show the graphs. People smart folk will notice our attempts to influence others even as we deploy a Body smart story. That’s really okay, though. We’re spreading the wealth so all the Smarts get some attention. We’re also being more intentional and creative about our preaching, and that can only be good. You can find more information about Dr. Gardner’s work, including a number of links here. We have more detailed descriptions of the Smarts and how they work in worship in our Smart of the Week collection. Be sure to check out our Resource page, too, for some ideas we’ve tried and links we like. And of course, dive into the show with our latest episodes. 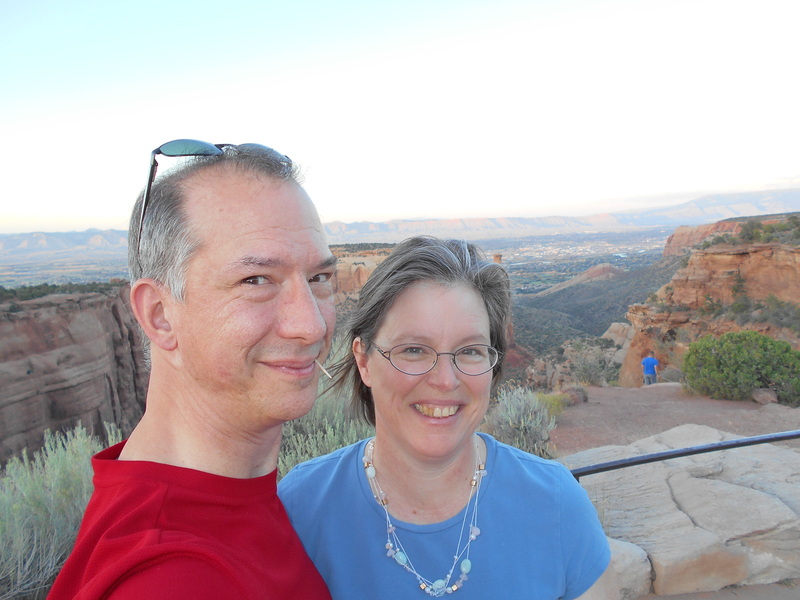 Molly and David on a recent trip to Colorado National Monument in Fruita, CO. Some years ago, a friend and colleague of ours invited us to be part of a lectionary discussion group with the idea of exploring the lectionary texts for ways to include multiple intelligences in our preaching. It was an exciting idea she had gotten from a workshop she had attended. To be honest​, though, while we continued to meet regularly for several edifying years and enjoyed it thoroughly, we didn’t keep up the multiple intelligence part for very long. In 2015 we were wanting to work on a new creative project together outside our regular church work. We decided to try a podcast. After several possible ideas and a few misfires, we came back around to the multiple intelligence preaching, and it rang a bell. So we decided to develop it as More Than Hearing. We hope this will become an inspiration for your own creativity and that you will share your ideas, questions, and successes with us and the MTH community.